Blue Sky Window Cleaning is Perth’s leading window cleaning company. In business since 1998, we have served thousands of satisfied customers. Contact us now with your requirements by calling us on (08) 9244 2226 or by filling the quick contact form in the right sidebar. 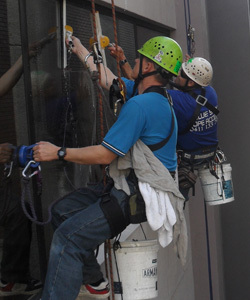 We provide window cleaning to large scale buildings in Perth and our strength is our highly skilled and experienced staff who find solutions to our clients’ requirements. Blue Sky Window Cleaning is the expert in the identification of different types of glass and in the assessment of which cleaning products and techniques will give you the best results. Dealing directly with a fully owned and operated West Australian company, you are assured of having your work done from quotation to satisfaction, through one point of contact, professionally and safely. Blue Sky is fully insured with Public Liability and Work Cover for our safety and your peace of mind. Blue Sky Window Cleaning Perth is compliant with National Health and Safety legislation. We have implemented safety management policy according to this legislation. We serve many clients in our service area – Joondalup to Mandurah. We specialize in all types of high rise window cleaning Perth, especially large contracts and multistory complexes. We have the qualified staff to do the work no matter what the job requires. The Pure Water Fed System delivers better cleaning results due to the dirt particles being agitated using a purpose made, soft bristled brush, and rinsed away using pure water. Blue Sky will send the staff, with the right qualification, to complete your work so that it is carried out safely and professionally. Learn more about the other services we offer.